There is nothing better than a good beer. Maybe good food, but pair together we call that heaven…and at least a damn good night. 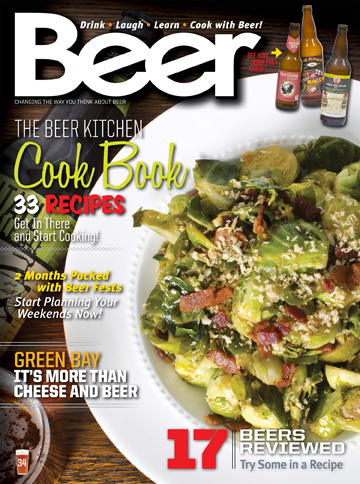 The newest issue of Beer Magazine showcases the growing culture of great food and great beer. 33 mouth watering recipes that will either make you drool on your tablet, or run to the kitchen. Download this issue for just $2.99, or subscribe for just $9.99 and get every future issue of Beer Magazine delivered to your tablet, computer, or Mac. Download instantly for just $2.99! Green Bay – Tried to Kill Me. It didn’t. 33 Recipes that use beer as an ingredient. Drink it, now eat it. Is that the same? This is our first special issue featuring 33 amazing recipes that you can make at home. Some may be beyond you boiling water, but you can drink and cook at the same time, and then eat what you drank. Crazy right? Just $2.99 gets you a quick easy download, or just $9.99 gets you a subscription. Do it.